Walter Crane is considered one of the strongest contributors to English children’s illustrated literature. His work is still printed in children’s books today. 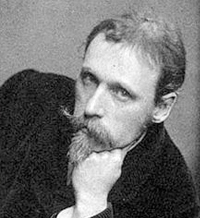 About the artist: Walter Crane (1845 – 1915) was an English artist and book illustrator and is considered one of the most prolific children’s book creators of all time. Crane was part of the Arts and Crafts movement and produced an array of paintings, illustrations, children’s books, ceramic tiles and other decorative arts throughout his life. Crane has also been praised for his iconic images associated with the Socialist movement. His work is characterised by sharp outlines and flat tints, contrasted by subtle colours and gentle facial expressions. Crane’s father was a portraitist and miniaturist. His elder brother Thomas also went into illustration, and his sister Lucy was a writer. From the early 1880s, Crane worked under William Morris’ influence and became closely associated with the Socialist movement. He was heavily inspired by Japanese print art and ceramics. He died in Horsham, West Sussex.